Several major fires in this region so far this summer. I missed working on the Milford Flats fire that charred a huge patch of central Utah in June. We were keeping busy at the time, trying to eradicate noxious weeds in the Manti La Sal National Forest. In July we had a very close call with the Salt Creek fire that burned within a mile of homes in my neighborhood. I spent a big chunk of time working on that incident. Most of my work involved manning and operating the water tender. It is basically a big water tank on wheels. Water tenders are vital to fire operations in this area because there are so few places with available water resources. The tenders shuttle water from local sources out to the fire to replenish the small water supply carried by tactical firefighting engines. 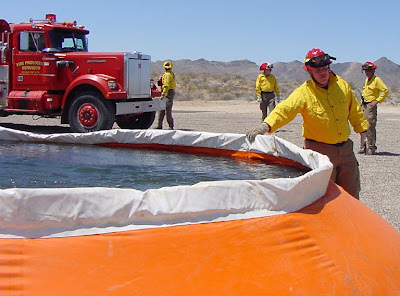 The water tender can also bring water in to provide local resources for helicopters. There were several helicopters and small planes dropping water and chemical fire retardant on hot spots during the Salt Creek fire. Sometimes there is no nearby source for the helicopters to draw water. So we deploy these big plastic pools that hold 6000 gallons. The water tenders bring water from available sources and replenish the supply in the pool, while the helicopter dips the bucket into the pool and carries another drop to the fire. For the last week we have been working on the Lowry Canyon fire. Location of Lowry Canyon fire. It is a curiosity that the valley east of the fire is named "Japanese Valley". Several stories circulated about an internment camp that was located here during WWII, but I have never heard of it before, and was skeptical. 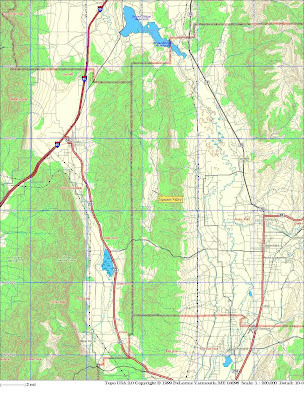 I know about the big camp that was at Topaz, but didn't know of any such in Sanpete County. The fire started from a lightning strike last week, and was burning in Juniper and Oak chaparral in the wild mountain area between Gunnison and Scipio. No homes or properties were threatened, so the strategy for firefighting was mostly just to keep it confined to the top of the mountain, and prevent it from spreading down through any of the nearby valleys. INDIANOLA—The Indianola Valley Fire Department (IVFD) is back to its routine of training meetings and fighting routine fires after a baptism by fire, at least figuratively, this past summer. Established two years ago, IVFD volunteers, who specialize in wild land fires and fire in urban interface zones, tested their mettle in three state-level fires—Milford Flats, Salt Creek and Lowry fires. 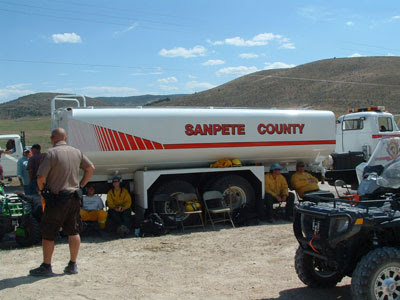 In the Milford Flats fire, said to be the biggest forest and wild land fire in Utah history, and in the Salt Creek fire, which threatened populated areas in Sanpete County, the IVFD firefighters got to rub shoulders with Type 1 teams, the crackerjack national teams that are sent in to fight the most serious fires. Three IVFD volunteers spent five days fighting the Milford Flats fire, which led to two deaths and scorched 160,000 acres in Sevier, Millard and Beaver counties. On July 19, several IVFD volunteers, with support from a Utah County fire team, were fighting a routine fire near Eagle’s Landing near the Sanpete-Utah County border. That’s when they were alerted to a forest fire moving from Salt Creek Canyons up mountain draws into the hills above the Indianola Valley. “They went from one fire to the other without touching home,” Meyers said. All 13 certified IVFD firefighters worked on the front line of the fire. 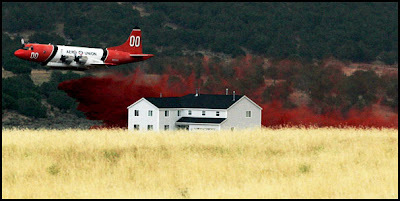 Some of them even came off their assignments “with retardant on their uniforms,” she said. One of their main duties was constructing hand lines, or trenches, to stop the fire’s advance. They also stood by the county’s tanker truck at the Hilltop command post and supplied water to fire engines from a host of fire departments. Those trucks then drove into the fire area and used the water to put out flames or to wet down vegetation to reduce its vulnerability to fire. IVFD also played a big role in “mop up,” which primarily involves “cold trailing,” several firefighters walking in formation across burned area feeling the ground to make sure it’s cold. 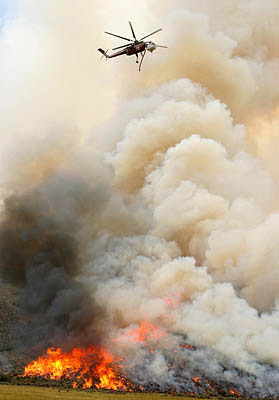 When firefighters saw a wisp of smoke, they dug at it with picks to cover it with dirt and sprayed the site with water. “More than one fatal fire has been assumed to be contained, only to blow up later and unexpectedly trap people,” Meyers said. The Salt Creek fire exacted a big commitment from the IVFD volunteers. They left home at 6:30 a.m. to attend a briefing at Juab High School in Nephi, where they got their assignment for the day. They fought the fire until after dark and then returned to Nephi to do paperwork. They got home about 11:30 p.m. Since its founding, the IVFD has always brought one of its engines to the Fairview Parade on July 24. Meyers said she got a tremendous response from the crowd. The Salt Creek fire not only taught IVFD firefighters new skills but also helped them identify equipment that would support their mission of preventing and fighting wild land and urban interface fires. The Salina Fire Department brought two “pumpkins” to the fire. The big orange devices look like giant versions of a child’s inflatable wading pool. The pumpkins hold 5,000 and 6,000 gallons of water. 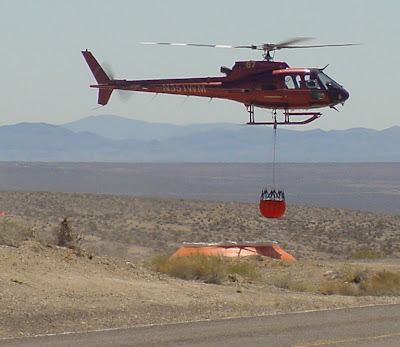 They provided a water reservoir where helicopters swooped down and refilled their buckets. The IVFD looked into acquiring one, managed to get it, and about a month later took it to the Lowry fire, which burned about 1,000 acres west of S.R. 28 near the Juab-Sanpete border. The department’s next goal is to get its own fire station in the Indianola Valley, although so far, the Sanpete County Commission hasn’t come up with a way to finance the project.